I’ve mentioned before that I love making things with cardboard boxes that would otherwise be thrown away. 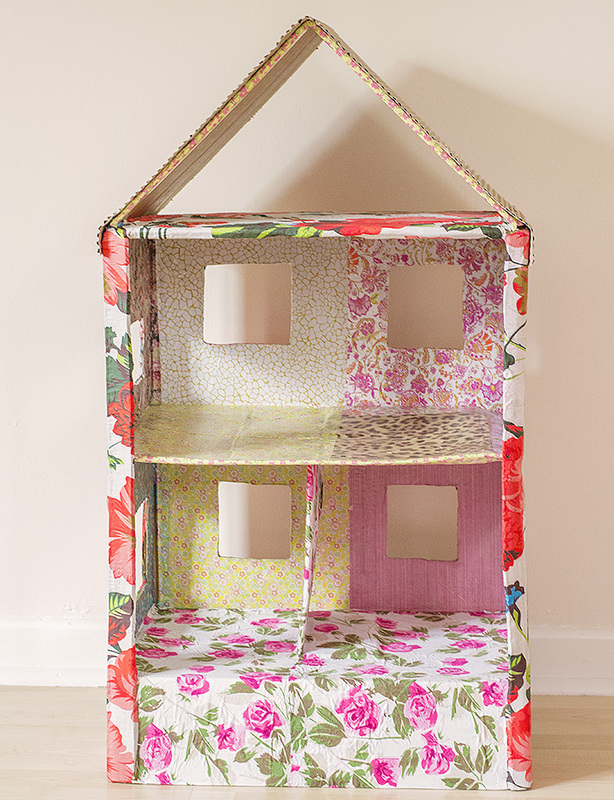 When we ended up with a huge one I knew I wanted to turn it into a dolls house. I used a bread knife to cut the front off and make the holes for the windows. Admittedly I didn’t bother measuring them so they are really wonky which doesn’t bother me but if you like things to be precise then definitely measure! I turned the top of the box that I’d cut off upside down and used it as the bottom floor, you can see this in the photo below. Then I folded the roof in half and stuck it on the top. I used corrugated cardboard to cover it too. I also put slits in the side and inserted another piece of cardboard to make the upstairs floor. I used my glue gun to secure it all in place. I used some leftover decopatch paper we had lying around as wallpaper, it is a very random selection but I don’t really mind that. I used some decopatch glue for that, one layer underneath and one on top. Then I used a couple of my old dresses to cover the outside and the bottom floor. I just used PVA glue for that part. 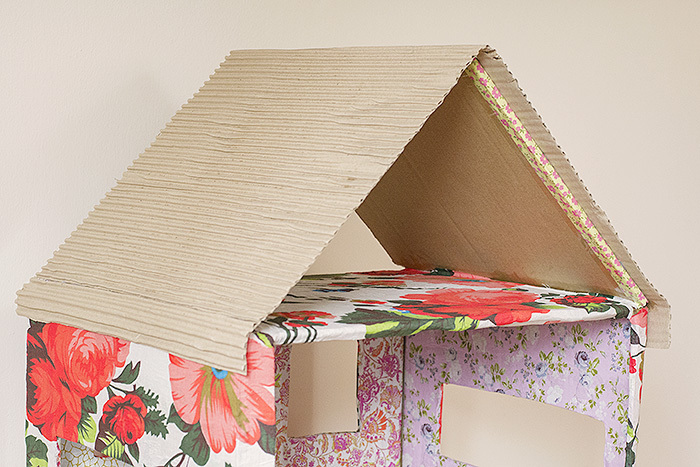 Then I used my glue gun to stick some corrugated cardboard on the roof and washi tape (I got mine from here) to cover all the open edges. I used a layer of normal sellotape over the top to secure it. The dolls house is so sturdy and absolutely huge, a wooden one of the same size would cost around £200 and this cost absolutely nothing! 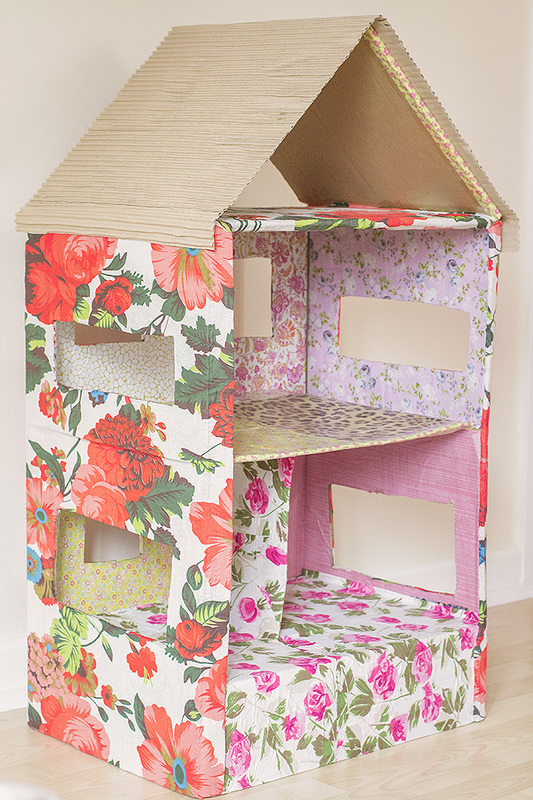 Of course if you wanted to then you could spend more money on choosing matching decopatch paper for the inside and out but I wanted to do it using things we had lying around. Next step is to sort out the furniture, curtains and to add a staircase going down from the loft to the middle floor. Why not try setting up an Ice-Lolly Stick Play Mat outside the house too?